English 135 is an improvisational workshop in creative nonfiction that connects you to current reporting opportunities; gives you structured choice in assignments; and teaches you how to write about hard subjects for and about young people. Big Questions about the social, emotional, relational and physical structures that affect young people require clear, engaging prose that avoids self-importance. Sometimes it’s even funny. Throughout this course, you’ll practice real-world skills without which even excellent writers may founder: initiative, scheduling, public reading preparation, and a meditative habit of observing—as if the same old world were born fresh every day. Which it is. This course is designed as a group internship in association with SafeKidsStories.org, a blog and social movement devoted to promoting safe havens for children and youth. You will work on and off campus, conduct workshops, curate, write, research, and publish. You will promote stories and events, including fall visits to the Penn campus by MK Asante, the filmmaker, professor, and author of the searing memoir and literacy lovesong Buck; and by David Daley, journalist and author of Ratf**ked: The True Story Behind the Secret Plan to Steal America’s Democracy. You will write compact and engaging prose for blogs. You will also write Facebook posts and Tweets to accompany your own and your colleagues’ work. 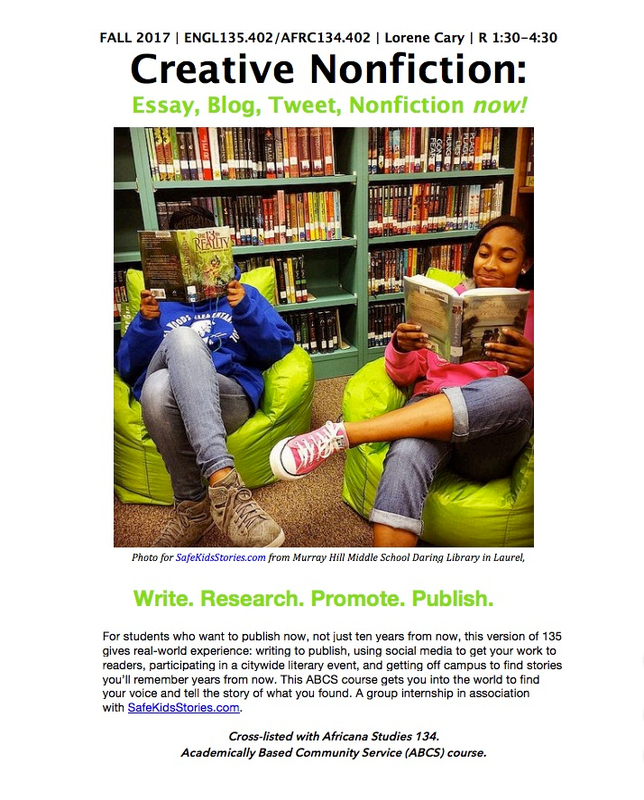 You will give a workshop to high-school or middle-school students, and you will edit their work for possible publication, too. If we do the job right, we will shine a light on those among us who make young people safe in an era of fear. If we make it fun to read, look at, and listen to, then, we’ll be on our way to creating community—and stealth culture change. This class is cross-listed with Africana Studies 134.